Favela Brass has a new volunteer brass teacher! Parisienne Zélie Denis recently graduated from the Versailles school of architecture and has been in Rio since February, living in favela Pereirão just down the road from the project. After a visit to Curry Clube last month, Zélie expressed an interest in teaching at the project and gave her first lessons yesterday. 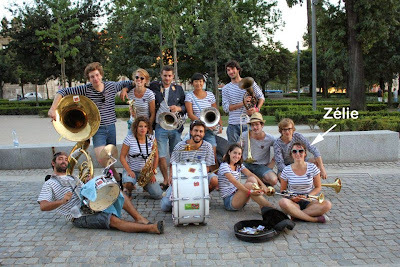 Back in Paris, Zélie plays trumpet with a brass band called Les Jacky Parmentier (she also plays tuba and flute), and from July to September will also take part in another international music education project for children called the Ooga Chaka Brass Band Project. Thank you very much for choosing to help us out Zélie, and welcome to the project!